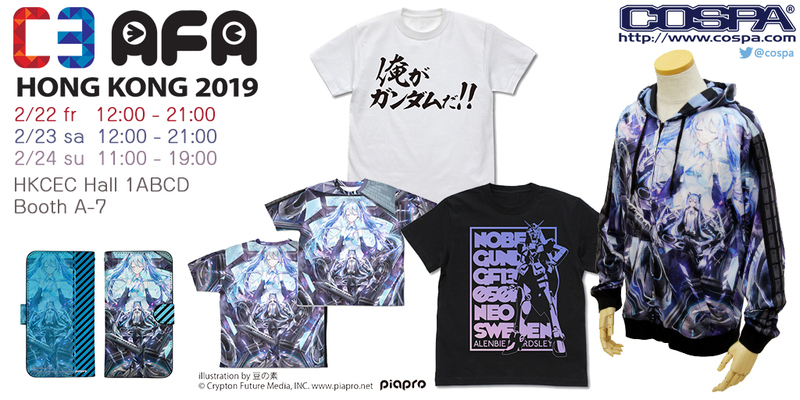 『C3AFA HONG KONG 2019』海外出展情報｜キャラクターグッズ＆アパレル製作販売のコスパ｜COSPA | COSPA,inc. We're going to participate in C3 AFA HONG KONG 2019! Here are some examples of goods we're bringing to you! Look forward to seeing you all in Hong Kong! Please confirm that the goods and sizes are correct during purchase. It is difficult to arrange refund, exchange or replacement after you left our booth. For more information, please refer to C3AFA HONG KONG 2019 offcial website.